I’m Dounia Belmazouar and I’m working on a PLAYBOX for toddlers at Cultureghem with the support of the Bernard van Leer Foundation’s Urban95 Challenge fund. Cultureghem is a non-profit organisation in Anderlecht at Abattoir – a marketplace and a slaughterhouse, but above all else a meeting place for all. We are developing a 10,000 square-metre heritage covered market, built in 1890, as a community space. Every wednesday afternoon, we transform it into KETMET: the biggest covered playground in the city. 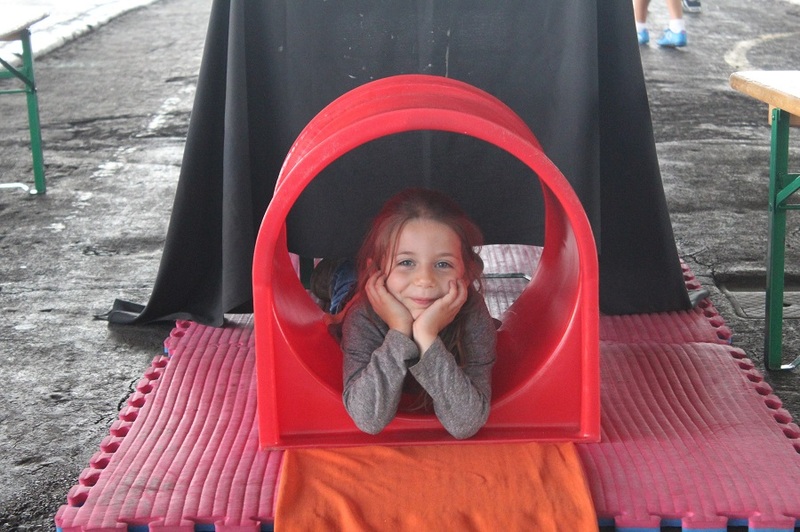 We roll out our PLAYBOXes – big wooden rolling boxes, filled with toys and tools for young and old – and encourage everyone we meet to become part of our playground and play, play, play. At our weekly activities, however, parents made clear that our PLAYBOXes were not well enough adjusted to the age of their toddlers. We also noticed that there is a serious lack of play options for very young children in public space. For these reasons, I am creating two PLAYBOXes for children between 0 and 5 years, with the help of different organisations in the neighbourhood. One PLAYBOX will be filled with themed modules: for example, a module with materials to improve fine or gross motor skills; a module with materials that stimulate the senses; a module with materials to stimulate the toddlers to move and jump. The other PLAYBOX will be a snoezelbox, where the children can enjoy a little bit of silence and relax. In this playbox you can find picture books, a puppet showcase and pillows. I believe that these PLAYBOXes will not only create an extra offer at KETMET for our visitors, they will also enable me to hit the streets on other days to have workshops in nursery schools, kindergartens and other public spaces. Learning at every turn what works, and what doesn’t. Improving them step by step. This is possibly the most interesting part of this project: the search for the perfect PLAYBOX and developing different modules has enabled me to meet a lot of new partners, all with their own specific view on how to raise a child. They make my ideas stronger and keep me going in the right direction. Even after the tools are developed, tested and built, we will have to keep working together to find new ways to activate public space for toddlers. The work is never finished. Strong cohesion and collaboration among the different organisations is very important to make it work. Personally, I think that a young child needs to play and needs to be in contact with all kinds of materials. Materials that serve as a sensory stimulus. Materials that can stimulate them to discover different sorts of textures, senses and sounds. We, as adults, need to give them this opportunity and need to be aware of the impact of materials on the development of young children. That’s why we want to thank the Bernard van Leer foundation for their support and invite everyone to come and play during the 2018 season of KETMET – at Cultureghem, or somewhere else in the city.